The California School Campus Database (CSCD) is now available for all public schools and colleges/universities in California. CSCD is a GIS data set that contains detailed outlines of the lands used by public schools for educational purposes. It includes campus boundaries of schools with kindergarten through 12th grade instruction, as well as colleges, universities, and public community colleges. Each is accurately mapped at the assessor parcel level. CSCD is the first statewide database of this information and is available for use without restriction. While data is available from the California Department of Education (CDE) at a point level, the data is simplified and often inaccurate. CSCD defines the entire school campus of all public schools to allow spatial analysis, including the full extent of lands used for public education in California. CSCD is suitable for a wide range of planning, assessment, analysis, and display purposes. 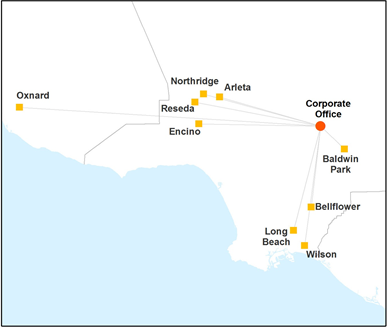 The lands in CSCD are defined by the parcels owned, rented, leased, or used by a public California school district for the primary purpose of educating youth. CSCD provides vetted polygons representing each public school in the state. Data is also provided for community colleges and university lands as of the 2018 release. IMPROVED ACCURACY: CDE school points are primarily placed at or very near the school they represent. However, there are cases where school points are located far from their true location. These errors have been corrected in CSCD. 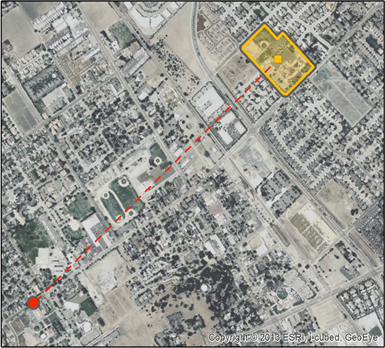 The California School Campus Database (CSCD) identifies the campus nearly a mile (5,106ft) to the northeast. 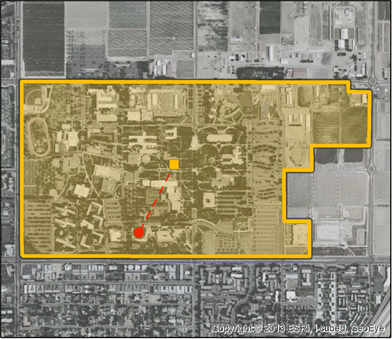 FULL CAMPUS BOUNDARY: CDE data is point based and does not provide informationon the extent of the campus footprint. The California Department of Education (CDE) geocodes each school address and assigns them latitude and longitude values. Points tend to be located on the street centerline or at the edge of the campus. The California School Campus Database (CSCD) defines the full campus of each school using assessor parcel data and aerial imagery. University high school is 265 acres. 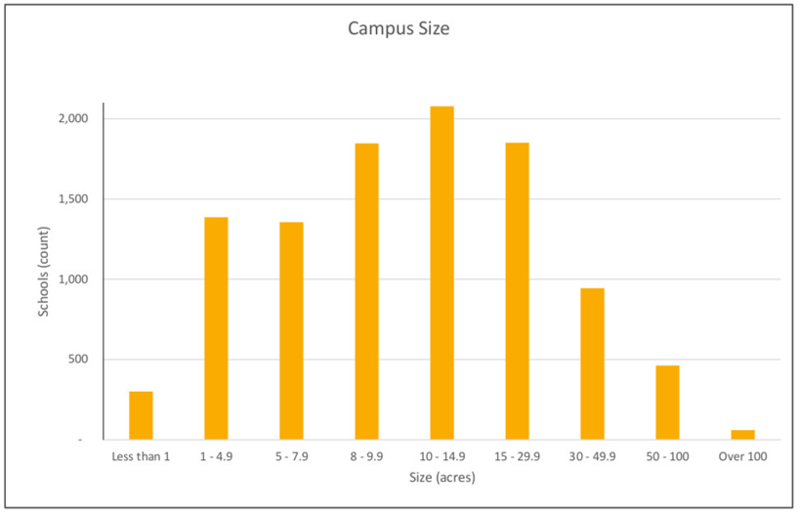 CAMPUS SIZE: Schools vary greatly in size. Statewide, 60 schools are over 100 acres and 301 are less than one acre. For policymakers, researchers, and those interested in land-based programs it is critical to know the size of a school campus. This allows for the consideration of school gardens, habitat values, water recharge, and other enhancements. MULTI-CAMPUS REPRESENTATION: CDE represents each school with one point and CDS code. However, some schools, including charter schools, operate at multiple locations under the same CDS code. CSCD defines all individual campuses, including all known charter branch locations with instruction. The California Department of Education (CDE) tracks one location for charter schools despite branches in multiple clities. The site reported by CDE is often an administrative or corporate office where no student instruction is present. The California School Campus Database (CSCD) defines all known branch campuses. 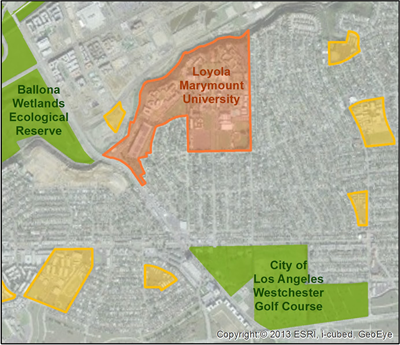 Aerial imagery, assessor parcel data, and school websites are used in researching campus locations. FLEXIBLE DATABASE DESIGN: CSCD has been structured to allow for expansion as well as joining of additional school attributes. All schools are identified by a unique CDS code allowing data users to readily join other information, so long as it has a CDS code. Geographically, schools are defined by the assessor parcel unless the school campus differs greatly, allowing for alignment with other layers such as parks and jurisdictional lands. The California School Campus Database (CSCD) can be used alongside university campus data and parks and open space. The use of assessor parcel data for alignment minmizes silvers and gaps in analysis. Available via ArcGIS Online service and MapCollaborator. All data users are responsible for reviewing and agreeing to the disclaimer statements outlined in the user manual. CSCD in no way implies permission to enter any school campus. Proximity to parks and open space for off-campus "joint use" policies, which make school grounds accessible as public parks during certain hours or seasons. Using CSCD? We would love to hear more about it. Send us a note to cscd@greeninfo.org. CSCD has no ongoing funding source. Improvements are made only when funded. But you can help! Submit feedback using GreenInfo Network's MapCollaborator application. Users can create new boundaries, edit boundaries for individual schools, as well as to attach general notes. Email us your data (tables, maps, documents, or the like) for review. School boundary data is crucial to analysis of activities near schools. Contributions to improve the data are processed as funding is available. GreenInfo welcomes interest from those who might wish to invest in the expansion of this important data set. CSCD is suitable for a wide range of planning, assessment, analysis, and display purposes. It should not be used as the basis for official regulatory, legal, or other such governmental actions unless reviewed by the user and deemed appropriate for their use. See the user manual for more information. The first release of CSCD was developed by the Stanford Prevention Research Center and GreenInfo Network, with funding from the Tobacco-Related Disease Research Program grant #22RT-0142, PI: Lisa Henriksen, PhD. CSCD 2018 was funded by a grant from the National Cancer Institute to Stanford Prevention Research Center grant 1R01-CA217165, PI: Lisa Henriksen, PhD. CSCD was developed using Esri software under the Conservation Program. CSCD is published by GreenInfo Network. Updates will be published as funding is available.